Over the years, we narrowed down the focus on our cow herd. To start, we want highly productive cows that are docile and good uddered, without sacrificing power. We first choose cows that have dimension – body depth, chest width, length and easy fleshing – because these are the phenotypic attributes we find are the most profitable in our herd. Then, our cows must be moderate framed and easy fleshing to thrive in the harsh, South Dakota climate. These are the type of cows we have found work for us, instead of us working for them. When you have two people calving 550 synchronized cows, it’s essential to have good mothers that won’t cause problems. At this rate, there isn’t always time to mess with an individual when we’re trying to save the entire herd. 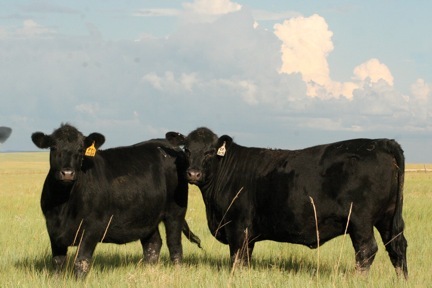 We guarantee bulls will produce calves that grow on the ranch, as well as in the feedyard. The offspring produced by our bulls are some of the best the Kansas feedyards have ever seen. The last set of heifers we sent were fed 111 days, gained 5.77 lbs per day, and converted 5.02 on a dry matter basis. That’s why we believe you can have it all. Some of our early bred heifers still on pasture.